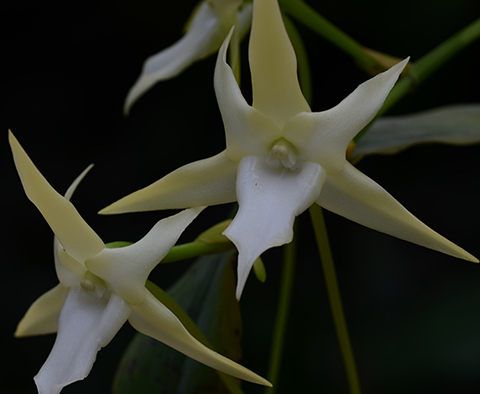 Winter is the season for night-fragrant Angraecoid orchids, two in particular. The first is Angraecum eburneum superbum, which starts flowering for us in November. The second is one of our most famous orchids, Angraecum sesquipedale, aka Darwin's Orchid, the Star of Bethlehem Orchid or the Comet Orchid, opening this week. Angraecum sesquipedale is fascinating for lots of reasons, but today's post is just about its dreamy almost narcotic fragrance. The Darwin connection I'll take up in another post. 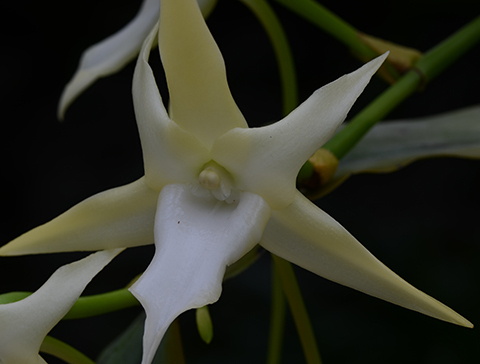 Angraecum sesquipedale is completely scentless during the day, and our daytime visitors just nod politely and walk away when told that it produces one of the best scents in the orchid family. But wait! As darkness gathers the orchid releases a beguiling combination of scents--lily, Gardenia and Nicotiana. Interestingly, the scent changes as the flower matures. As Roman Kaiser writes in The Scent of Orchids, this description "applies to the fully developed flower on its 3rd or 4th night after blossoming. During the first two nights, the scent is rather mixed, with a fairly marked indole note. This latter compound is found in the majority of night-scented flowers." Night-fragrant flowers often produce scents reminiscent of jasmine, honeysuckle, tuberose, lilies and Gardenia. In the perfume trade, these scents are known as 'white-floral', and have been reproduced in a number of great perfumes. Night-fragrant orchids that produce these scents are often white and are highly attractive to nocturnal moths and, apparently, people. The effect on our nighttime visitors is remarkable. Many seem oblivious to the dazzling lights display as they veer off into the darkness in search of the source of the intoxicating scent.